Two Technologies JETT•ce Hand Held Computer - Two Technologies, Inc. Designed for one-handed operation, the JETT®ce features a powerful Microsoft® Windows® CE .NET 4.2 operating system, Intel® XScale® Technology Processor, color sunlight readable display with touch screen technology, and a variety of interface capabilities. Looking for the latest in hand held computer technology for industrial and commercial use? 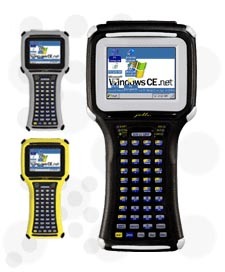 Designed for one-handed operation, the JETT®ce features a powerful Microsoft® Windows® CE .NET 4.2 operating system, Intel® XScale® Technology Processor, color sunlight readable display with touch screen technology, and a variety of interface capabilities. Two Technologies, Inc. now provides integrated wireless options for the JETT®ce. You can choose between WLAN 802.11b/g, Bluetooth® Class 1 or Bluetooth Class 2 when ordering a unit.